Just five years after a major international financial crisis the financial sector is now the largest beneficiary of World Bank Group investment. A push for channelling money through the private financial sector is occurring despite the failures of the financial systems of US and European countries in the last five years. 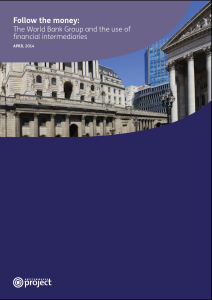 This report should be viewed as a research tool to stimulate debate about how civil society organisations can engage with the increasing support being given to the financial sector. With detailed information on IFC financial sector investments it allows civil society to discuss ways forward. Donors, international financial institutions and elites in developing countries are pursuing so-called financial deepening, which is one component of financialisation – the increasing importance of financial markets, financial motives, financial institutions and financial elites in the operation of the economy. It is a step change in the way financial institutions interact with the rest of the economy which has major implications for long-run economic development, including transforming the functioning of households and the productive parts of the real economy. While the World Bank and its private sector arm the International Financial Corporation (IFC) are leaders in this area, they are not the only public institutions that promote financial deepening or provide finance to the private financial sector in developing countries. A host of development finance institutions now operate in this fashion, including Brazil’s Banco Nacional de Desenvolvimento Econômico e Social (BNDES) and the China Development Bank. The UN’s Green Climate Fund plans to use this model. It is also likely the new development bank being proposed by Brazil, Russia, China, India and South Africa (BRICS) will use this method. From 2005, there was both a large increase in the IFC’s overall portfolio and an increase in the percentage of new commitments going to financial intermediaries (FIs). In the wake of the 2008 financial crisis, the IFC rapidly increased its support to the financial sector, especially trade finance. The IFC accountability mechanism released an audit into the social and environmental outcomes of the IFC’s investment in FIs in February 2013. It concluded that: “The result of [the] lack of systematic measurement tools is that IFC knows very little about potential environmental or social impacts of its [financial market] lending.” Communities in Honduras, Cambodia, India and Uganda have complained about negative impacts of FI investments ranging from water pollution, to land grabs, to torture and murder of farmers. 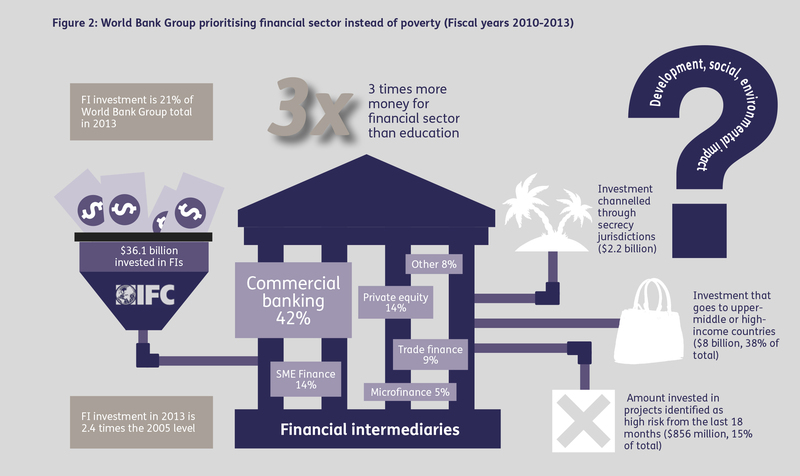 This has led civil society groups to demand a new World Bank Group strategy for investments in the financial sector. Between July 2009 and June 2013 the IFC invested $36 billion in FIs. This is three times as much as the rest of the World Bank Group invested directly into education and 50% more than into health care. The IFC justifies its investments in the financial sector because they “spur economic growth” that will then lead to positive development outcomes. The IFC’s portfolio of FI investments shows a concentration of funding in commercial banking rather than in small and medium enterprises (SMEs). Funding is also skewed to upper-middle-income countries such as Russia, Brazil, China and Turkey, despite the poor living predominantly in low-income and lower-middle-income countries. Additionally, at least $2.2 billion worth of public money from the IFC was channelled through secrecy jurisdictions because of their attractive low-tax, low-regulation environments. When assessing the development impact of investing in FIs, the IFC uses either reach indicators (the number of clients) or purely financial indicators (such as return on invested capital and return on equity). While an increasing number of public institutions are channelling capital into the financial sector there remain large risks from this approach for overall development efforts. The IFC has not proven the effectiveness of the FI model and should do so before commitments on such a massive scale are acceptable. The onus is on the IFC to show that investing in FIs leads to direct and tangible positive results for people’s livelihoods in developing countries. The broader question remains unanswered: Is this a valuable use of development resources? An expansion of investments in FIs at the expense of direct investments should only be done with clear proof that they have a greater positive development impact than direct investments. A preferable alternative model to consider development impact would include better client choice, stronger measurement, and more independent reporting and evaluation. Given the trend towards bolstering the financial sector with international public resources, it is important to grapple with the nature of FIs, their potential environmental and social risks, and question what development impacts they have for people living in developing countries. This report sets out three possible approaches for civil society to achieve this calling for: stronger rules, different operators and new tools based on different mandates and ownership models. The international development finance environment is currently fixated upon the use of the private financial sector as development actors, without fully thinking through the implications of this. Though use of the private financial sector as a channel of development finance is controversial, the fact remains that it is growing. Each national context, where different amounts of financial liberalisation have occurred and variable levels of governmental interest in sustainable and pro-poor development exist, will determine the best fit of approaches and strategies. Yet, unifying civil society positions and demands as much as possible can enable successful challenges to the underlying systems of international finance.